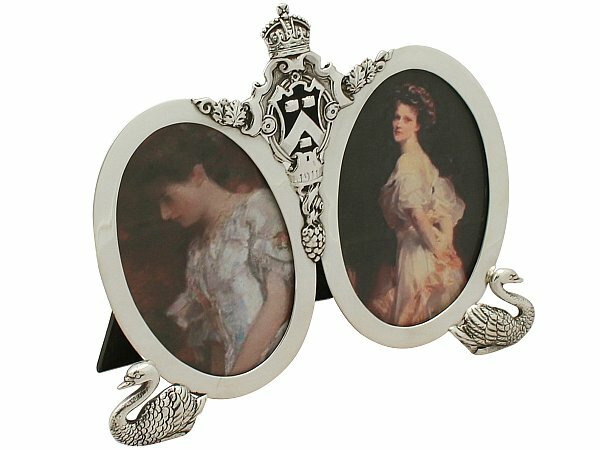 This exceptional antique Victorian sterling silver photograph frame has a double oval shaped form. The surface of this silver double photo frame is plain and embellished with an applied coat of arms depicting an escutcheon of a chevron between three rectangular charges incorporating black enamel tincture and surmounted by a King's Imperial/Tudor Crown . The coat of arms has eminating grape vine and leaf anchors and a suspended grape cluster design to the nadir. Each side of the frame has a plain oval internal ‘window’ with a broad sterling silver paralleling border. The anterior portion of the frame is supported by two applied and chased swan designs. This impressive silver double photo frame is fitted with two wood backs, each with a hinged strut, secured with two swivel catches. This impressive example of antique silverware is inset with removable glass panels. This frame has an unusual yet desirable configuration and style; double frames are more difficult to locate that single examples. This antique silver double photo frame is an exceptional gauge of silver, exceptional quality and in exceptional condition. The black enamel is in perfect condition. Height of internal window 8.9cm/3.5"
Width of internal window 8.7cm/3.4"